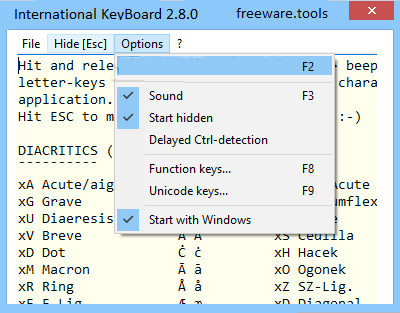 International KeyBoard is a small-sized tool that enables you to type special European diacritics with your normal keyboard, by using specific rules. This utility is quite non-obtrusive, as it goes in the system tray from the first launch. It is possible to interact with it through a small-sized context menu, and clicking the systray icon will bring up the main window. In other words and simply stated, you can very easily add special characters without changing the keyboard language, as well as assign other symbols to the function keys using this application. Due to the nature of this tool, some Antivirus software may alert and detect it as a keylogger. Simply add an exception. It encloses a list of all the diacritics, math symbols, punctuation and other special characters you can use, so that you can easily view how to create the item that interests you without changing the keyboard’s language. Aside from that, you should know it is possible to enable or disable sound, activate the program, set it up to always start at Windows launch, and assign text to function and Unicode keys. No other noteworthy options are included. International KeyBoard does not require a large amount of CPU and memory in order to function fully, while the response time is quite good. The interface is minimal and suitable to all users, and the tool does not produce any error messages, nor does it hang or crash. Overall, it is safe to say that this is a simple, yet useful piece of software which aids people in writing special symbols, characters and diacritics without needing to change their keyboard language.